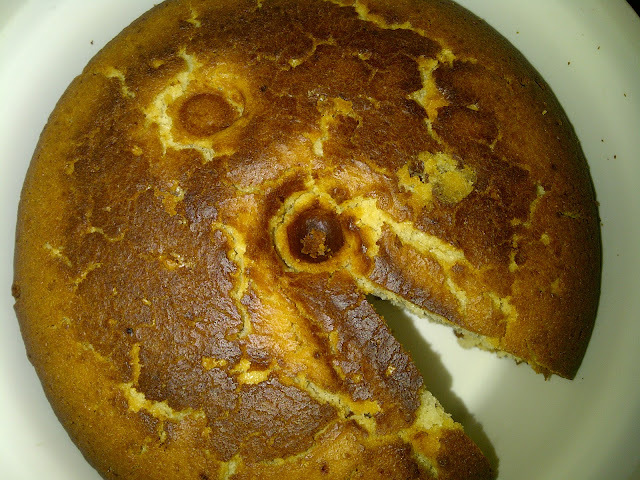 Soniaz Delights: My first Cake - An Eggless Cake made in a Cooker! So, today after weeks (months) of procrastination I finally decided to write this blog to share my experience and journey to this wonderful world of Baking. I started Baking in December 2011 when I have quit my job at Ernst and Young and was planning to get married soon. Like any other girl, I thought of wooing my future husband with some wonderful dishes (believe me it totally works..;)) and also to satisfy my taste buds (I am a big time foodie!) I decided to learn something which I totally love...a plain Vanilla Cake. This cake is very simple, doesn't need any fancy equipment to stir or even to bake. You can simply mix the ingredients by hand with the help of a spatula and bake it in pressure cooker which is a default cooking appliance in any Indian household. M sure the aroma of this cake baking in cooker will give you a sense of accomplishment. This cake is perfect with breakfast or afternoon tea or any time of the day. VANILLA CAKE...As simple as it gets. * Here I have used the word portion as it is not standard. You can use any small sized bowl (katori) for the measurement. In a large bowl, add malai and whisk it for 30 seconds to make it smooth. Add granulated white sugar (sifted) and fold it properly in Malai. Add vanilla essence and whisk the mixture. In another bowl sift all the other dry ingredients like milk powder, all purpose flour, baking powder and baking soda and mix it with the help of a whisk/ spatula. Add dry ingredient (in three additions) and milk (in two additions) alternatively starting and ending with the dry ingredients. Stir until all the ingredients combine nicely into the batter. Put the cooling ring inside the cooker and place it on gas stove with the lid on at medium heat for about 5 minutes. Grease the baking pan with some butter and dust a thin layer of all purpose flour. Alternatively, you can cover the baking pan with a piece of parchment paper or butter paper and grease it lightly with some butter. Cover the cooker with the lid and let it cook at simmer for about 50-60 minutes. You can open the lid and check the cake after 50 minutes. Insert a knife in the center of the cake, if it comes out clean the cake is done. If not, let it cook for next 10 - 15 minutes. Keep checking after every 5 minutes. This cake is best to have the day it is made and can stay good for 3-4 days in an air-tight container in room temperature. You can add 1 cup of choco-chips in the batter.